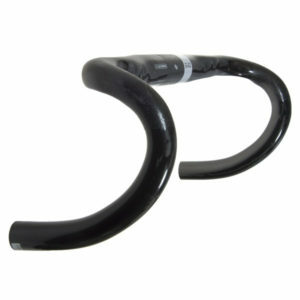 This is the 3rd test in our series, road handlebars. We’ve once again brought back our favorite engineer, Jason Krantz. Jason’s a mechanical engineer whose graduate work focused on the intersection of composite materials and finite element analysis. Jason has worked for several companies in the bicycle industry and never fails to amaze us with the depth of his cycling related knowledge. He adds real value to all of the tests we perform. Why do deflection testing on bars? 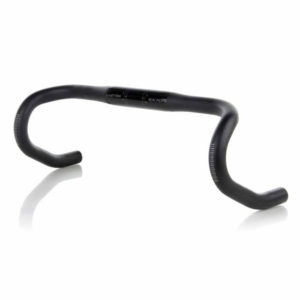 We don’t believe that there is any efficiency to be gained through a stiffer handlebar, so why test for that? 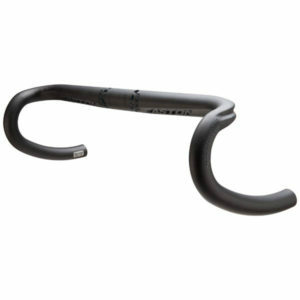 Losses in efficiency are minimal but a stiff handlebar and stem can make the bike feel especially responsive to rider inputs, especially out of the saddle. 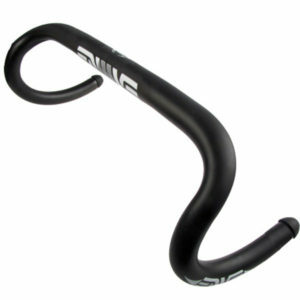 we’re unconvinced of any performance benefit to a stiffer bar, but many people like the feeling one provides. What we are convinced of is that the additive effect of parts that deflect more does at some point become a problem. The point at which it becomes a problem is different for different riders and terrains. Conversely, a flattened bar like the, Aerofly, Kwing, Metron, or Enve SES models will provide increased deflection (and therefore bump comfort) compared to a bar with a round cross-section. This may be desirable for gravel bikes or other builds where comfort is paramount. If you combined a very flexible, frame, steerer, stem, bar etc… into one bike you’d more than likely notice a lack of confidence in it’s handling. If you mounted the most rigid pieces you could find in one bike many people would find a lack of comfort. The ideal is some moving sweet spot in between that is different for each given set of circumstance. The goal of this review is not to identify a “winner” as there is no ideal result just a comparison to help each rider identify which bar may best suit their given set of needs. Notes about the loads tested: The actual load doesn’t matter because the response of the structure is linear. 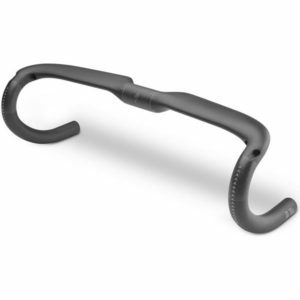 That is, a handlebar that deflects 2.5mm under a 25-lb load will deflect 7.5 mm under a 75-lb load, 10 mm under a 100-lb load and so forth. This assumption of a linear response to loads is valid roughly until an aluminum bar bends permanently (plastic deformation) or until a carbon bar breaks (brittle failure). These bars were loaded with 50 pounds because it’s a nice round number and a fairly realistic approximation of real-world conditions. If a sprinting rider is pushing on the left pedal with 200 lbf (in other words, he can squat 400 lbs), he must create an equal and opposite moment (twisting force) via the handlebars. The pedal is about half as far from the frame centerline as the handlebar drops are, so it would take a reaction force of 100 lbs at the right-hand bar to counteract the pedaling force. This is the same as applying 50 lbf up on the one side of the bar and 50 lbf down on the other; the total moment is the same. Notes about reach, drop and flare: One thing that has always bothered us is that there is no standard system for measuring reach and drop. 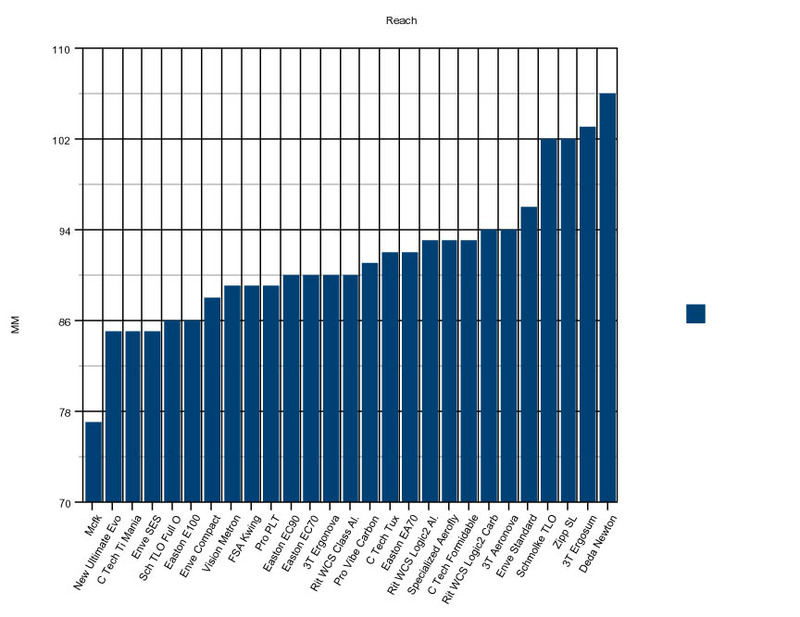 Actual vs. claimed reach particularly can vary dramatically, in this test alone the bars range by almost 3 cm in Reach. 3cm can be the difference between needing a 9 cm or 12 cm stem, yet many people don’t consider reach on their bars when making a choice. We decided to level the field here by measuring them all to the same standard. With the drops horizontal to the ground the reach is measured from the center of the top (where the bar mounts into the stem) to the leading edge of the vertical drop (where the lever would mount). Drop is measured with the drops horizontal to the ground and from center to center. For some companies our measurements may match up with what is claimed, but for others it may differ significantly because the manufacturer used a different measurement method. We have a separate listing for flare. 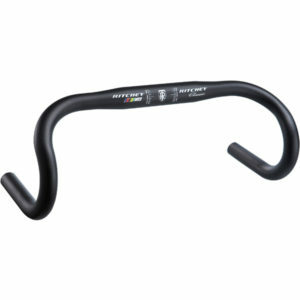 Flare is how much wider a bar is at the drops than where the levers mount. For some bars the widths in the locations are the same, but for others they may be as much as 4 cm wider at the end of the drops. 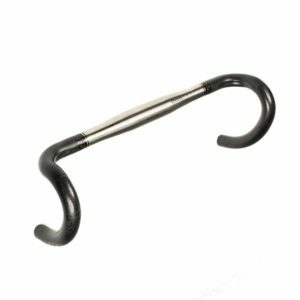 Carbon Fiber vs. Aluminum: While carbon offers little or no weight savings when applied to stems, the lightest handlebars are usually made from laminated fiber. 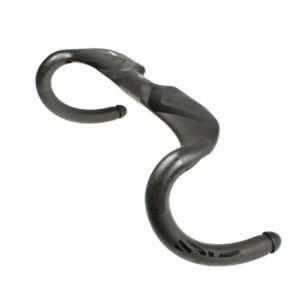 Handlebars are stressed primarily in bending, and 0-degree carbon fibers take these loads very, very well. When you throw in a few layers at 45 degrees to deal with torsional loads and maybe some circumferential reinforcements where the levers mount, you often end up with a bar that’s a bit lighter than the equivalent aluminum bar. As noted above, aluminum bars tend to fail by bending permanently (ductile failure) while carbon bars usually snap into pieces (brittle failure). While “shattered” carbon bars make for shudder-inducing post-crash photos, keep in mind that a strong carbon bar will shrug off loads that would bend its aluminum counterpart. Ductile failure is not necessarily a better failure mode than brittle failure. Reduced weight is a wonderful thing, but carbon bars offer another advantage: they tend to damp high-frequency vibration better than aluminum bars. 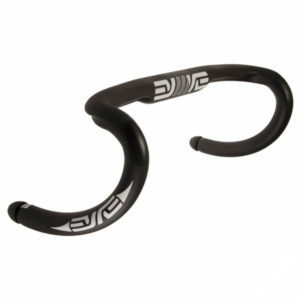 Composite structures generally damp vibration better than metallic ones, and many riders have found real-world damping benefits when they fit a carbon handlebar. It would be interesting to quantify carbon bar damping; one way to do so would be to wire an accelerometer to the drops and then gently strike or pluck the bar, letting it “ring” at its natural frequency. One could then read the accelerometer data to see how quickly the vibrations dissipated. This ring-down test may be on the Fairwheel menu for a future article, but is outside the scope of this test. Most bars are obviously similar in concept, but still very different in execution. 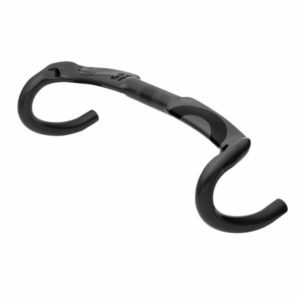 Finding a bar that is comfortable to a rider involves personal preference as to the shape and depth of the drop as well as reach, flare, sweep and flex. Because of this we’re going to keep our opinions on fit and shape to a minimum, leaving those up to each individual to find what is right for them. *You’re viewing a truncated table since we can’t fit all the data on a cell phone screen. To see all ten columns and eight data points we collected on every bar please re-visit our site on a desktop or laptop. Notes: Lightest of the 6 tested aero bars. 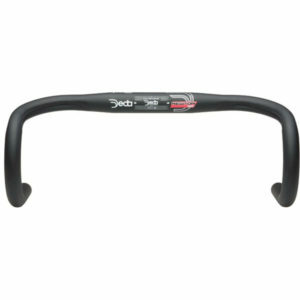 Longest reach of 6 tested aero bars. Notes: 2nd longest reach of all tested bars. Notes: Heaviest of all tested bars. 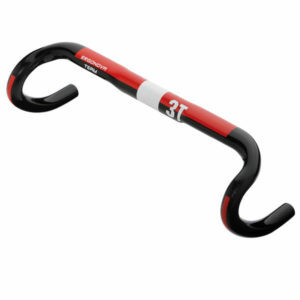 Lowest stiffness to weight of all tested bars. Notes: Only titanium tested bar. Titanium top, Carbon drops. 6th stiffest bar of all 27 tested. 3rd shortest reach of all tested bars. 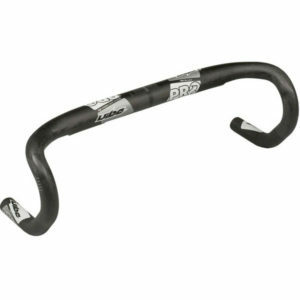 Notes: Least expensive of all tested carbon bars. Least stiff of all bars tested. 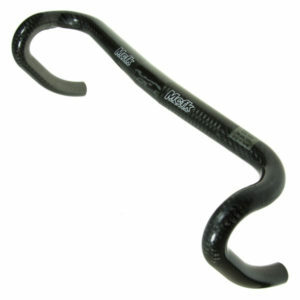 Notes: 2nd stiffest of 6 tested alloy bars (4th of all 26 bars) and longest reach of all 26 bars. Notes: 2nd heaviest bar of all tested bars. 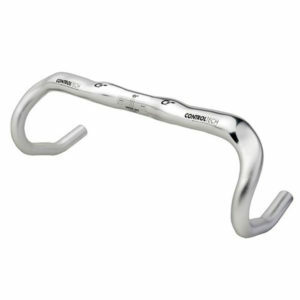 2nd least expensive of all tested bars. Notes: 2nd least expensive of all tested carbon bars. Notes: 4th in stiffness to weight of all 27 tested bars. 5th lightest of all tested bars. Notes: 2nd lighest and 2nd in stiffness to weight of 6 tested aero bars. 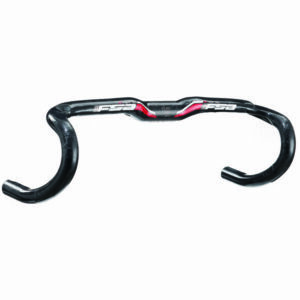 Shortest reach of 6 tested aero bars. Notes: 2nd deepest drop of all tested bars. Notes: Most deflection of all tested aero bars. 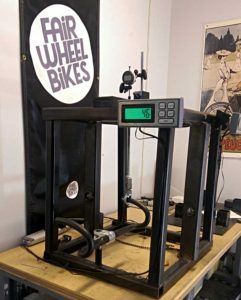 2nd lowest stiffness to weight of all bars tested. 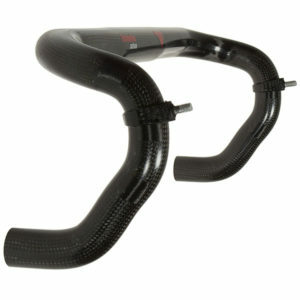 2nd shortest reach of all tested aero bars. Notes: Least expensive of all tested bars. 3rd stiffest of all tested bars. Shortest reach of all 6 tested alloy bars. Notes: Stiffest of all tested bars. 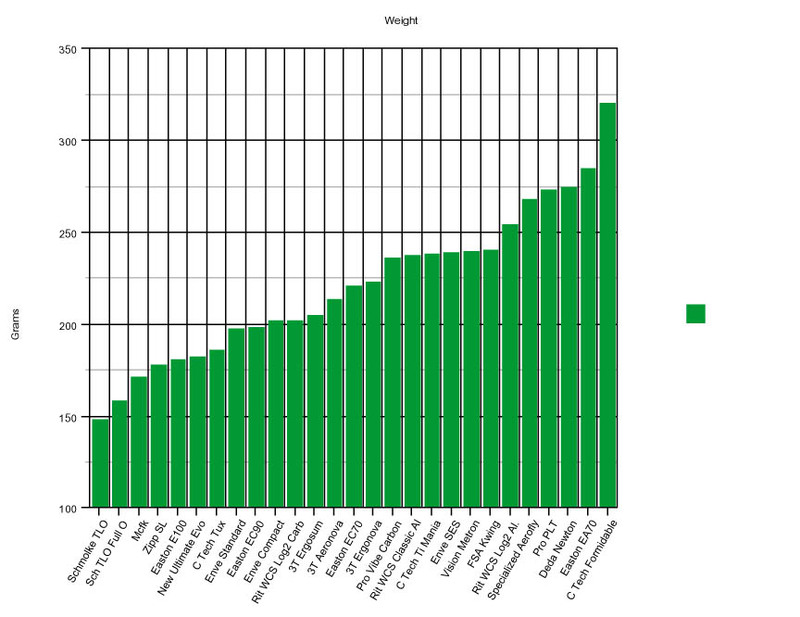 3rd in stiffness to weight of all tested bars. 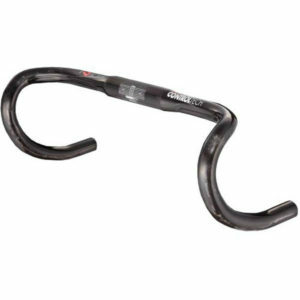 Heaviest of all tested round carbon bars. 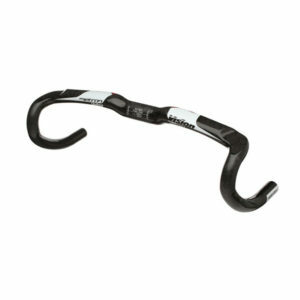 Notes: Least stiff of 6 tested alloy bars. 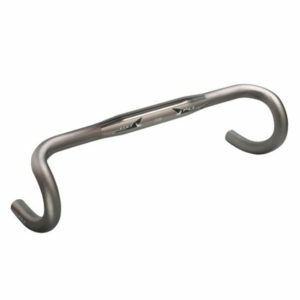 Lightest of 6 tested alloy bars. 2nd in stiffness to weight of 6 tested alloy bars. Notes: Best stiffness to weight of 6 tested alloy bars. Notes: 80kg rider weight limit. 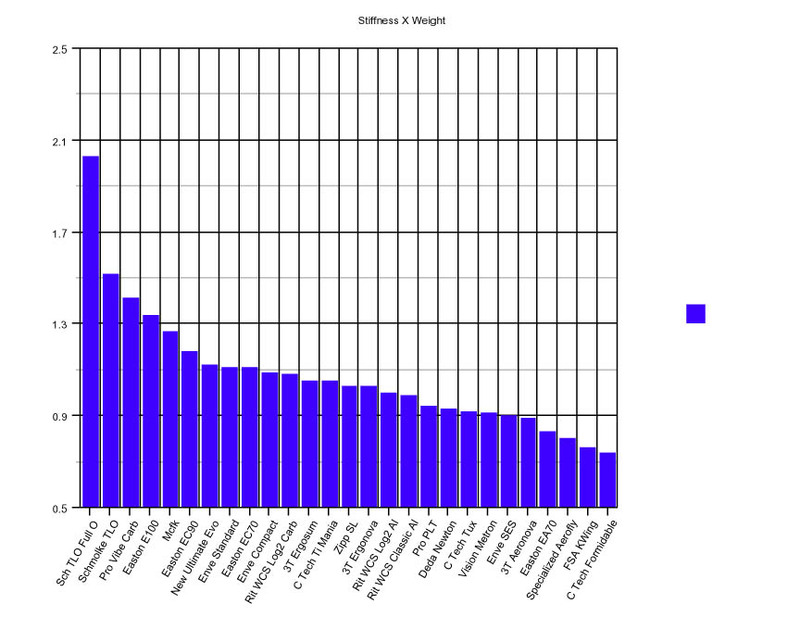 2nd in stiffness to weight of all tested bars. Lightest of all 27 tested bars. 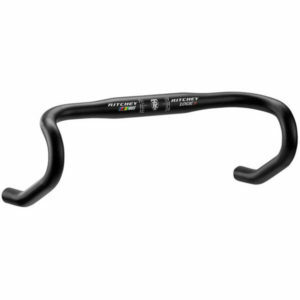 2nd most expensive of all tested bars. Notes: 75kg weight limit. 27.5mm diameter drops with custom shifter clamps. 2nd stiffest of all tested bars. 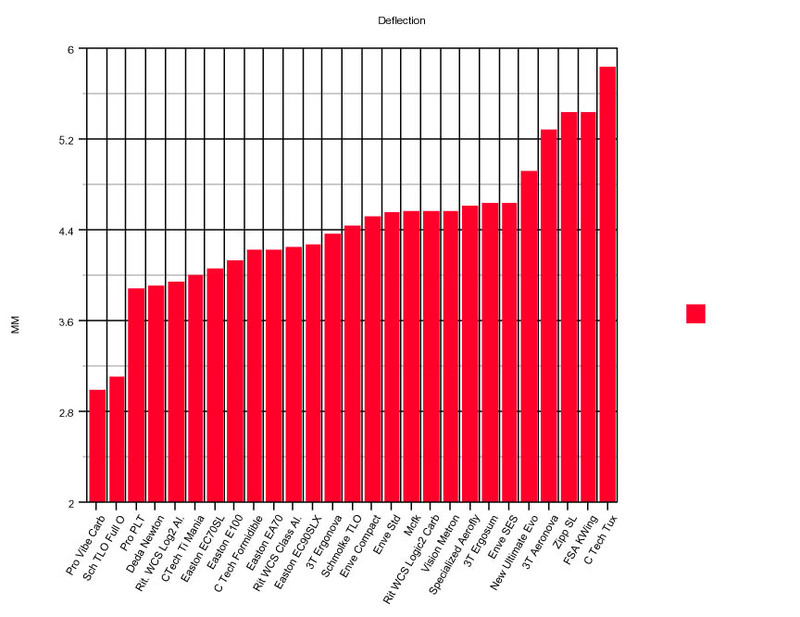 Best stiffness to weight of all tested bars. 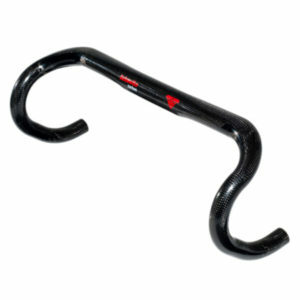 2nd lightest of all tested bars. Most expensive of all tested bars. Notes: 2nd stiffest of 6 tested aero bars. 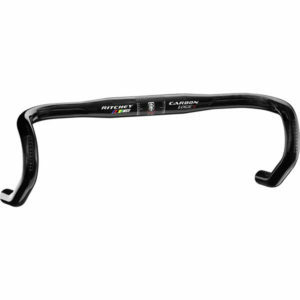 Heaviest of all tested aero bars. Notes: Stiffest of all 6 tested aero bars. Best stiffness to weight of all 6 tested aero bars. 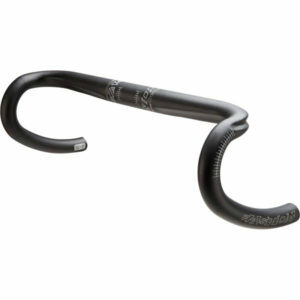 Notes: 4th lightest of all tested bars. 3rd longest reach of all tested bars. Deepest drops of all tested bars. Disclaimer: A lot of typing and numbers have gone into this article and we apologize in advance for any typos, but would warn that the possibility of mistakes is present.